Using his own experiences as a prisoner of war in Germany, Vonnegut's deeply satirical 1969 novel explores the human condition through the medium of science fiction. The protagonist, Billy Piper, is 'unstuck in time', and never knows which part of his life is going to experience next. In 1967, he is kidnapped by aliens, the Tralfamadorians, and exhibited in a zoo. During his stay on their planet, he learns that they have a completely different concept of time: for them, every moment, whether in the past, present or future, has always existed, always will, and will occur over and over again. They are able to revisit any part of their lives at will, and so to them an individual's death does not matter as they are still alive in the past. One of the most important events in Piper's life was witnessing the Allied carpet-and-fire bombing of Dresden (which killed 130,000 civilians and flattened 90 per cent of the city) and the descriptions of that horror bring home in gripping fashion Vonnegut's eloquent anti-war message. The Tralfamadorians are fatalists, and realize both the necessity of changing what it is possible to change, and the need to be wise enough to know what they cannot change. Billy Piper adopts this fatalism, and eventually he spreads it to the millions of followers. 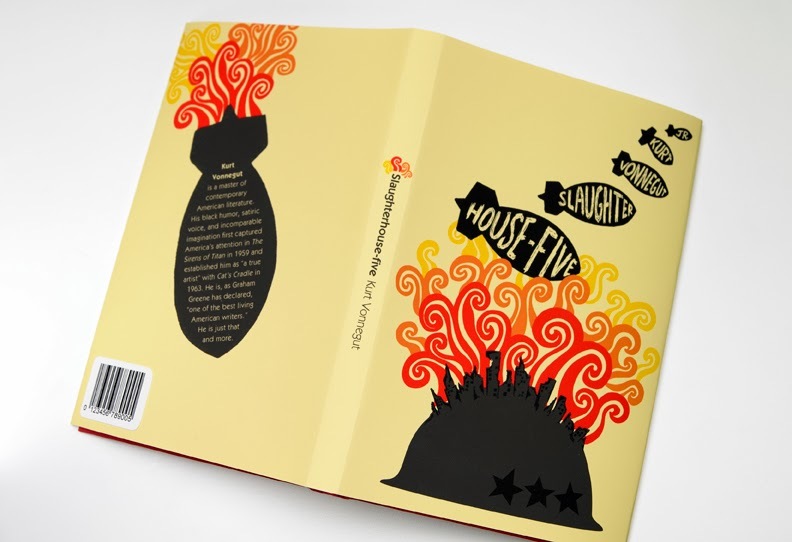 Despite its bleak message, Slaughterhouse Five is a deeply, if very blackly, funny novel. The direct style of writing leaves the reader free to get to grips with both the non-linear story and the results of Vonnegut's brilliant imagination. Billy invited Trout to his eighteenth wedding anniversary which was only two days hence. Now the party was in progress. Trout was in Billy's dining room, gobbling canapés. He was talking with a mouthful of Philadelphia cream cheese and salmon roe to an optometrist's wife. Everybody at the party was associated with optometry in some way, except Trout. And he alone was without glasses. He was making a great hit. Everybody was thrilled to have a real author at the party, even though they had never read his books. Trout was talking to a Maggie White, who had given up being a dental assistant to become a homemaker for an optometrist. She was very pretty. The last book she read was Ivanhoe. Billy Pilgrim stood nearby, listening. He was palpating something in his pocket. It was a present he was about to give his wife, a white satin box containing a star sapphire cocktail ring. The ring was worth eight hundred dollars. The adulation that Trout was receiving, mindless and illiterate as it was, affected Trout like marijuana. He was happy and loud and impudent. "I'm afraid I don't read as much as I ought to," said Maggie. "We're all afraid of something," Trout replied. "I'm afraid of cancer and rats and Doberman pinschers." "I should know, but I don't, so I have to ask," said Maggie, "what's the most famous thing you ever wrote?" "It was about a funeral for a great French chef." "All the great chefs in the world are there. It's a beautiful ceremony." Trout was making this up as he went along. "Just before the casket is closed, the mourners sprinkle parsley and paprika on the deceased." So it goes. "Did that really happen?" said Maggie White. She was a dull person, but sensational invitation to make babies. Men looked at her and wanted to fill her up with babies right away. She hadn't had even one baby yet. She used birth control. "Of course it happened," Trout told her. "If I wrote something that hadn't really happened, and I tried to sell it, I could go to jail. That's fraud." Maggie believed him. "I'd never thought about that before." "It's like advertising. You have to tell the truth in advertising, or you get in trouble." "Exactly. The same body of law applies." Do you think you might put us in a book sometime?" "I put everything that happens to me in books." "I guess I better be careful what I say." "That's right. And I'm not the only one who's listening. God is listening, too. And on Judgment Day he's going to tell you all the things you said and did. If it turns out they're bad things instead of good things, that's too bad for you, because you'll burn forever and ever. The burning never stops hurting." Poor Maggie turned gray. She believed that, too, and was petrified. Kilgore Trout laughed uproariously. A salmon egg flew out of his mouth and landed in Maggie's cleavage.